Landing in Santa Marta it soon became apparent that we were no longer on a Caribbean island. The cities are bigger, there are more people, a greater sense of hustle and bustle. The streets were filled with holiday travelers and street performers. Street vendors line certain streets, in some places they actually have stalls jutting out into the streets making it difficult to travel down the road. Many of the vendors are specialists. The hat makers have a wide variety of hats, and often a hat seller will carry all of his stock on his head. There are booths of only belts or only socks or only broom heads. How many broom heads can you sell in a day? It must be very difficult to make enough to survive that way. 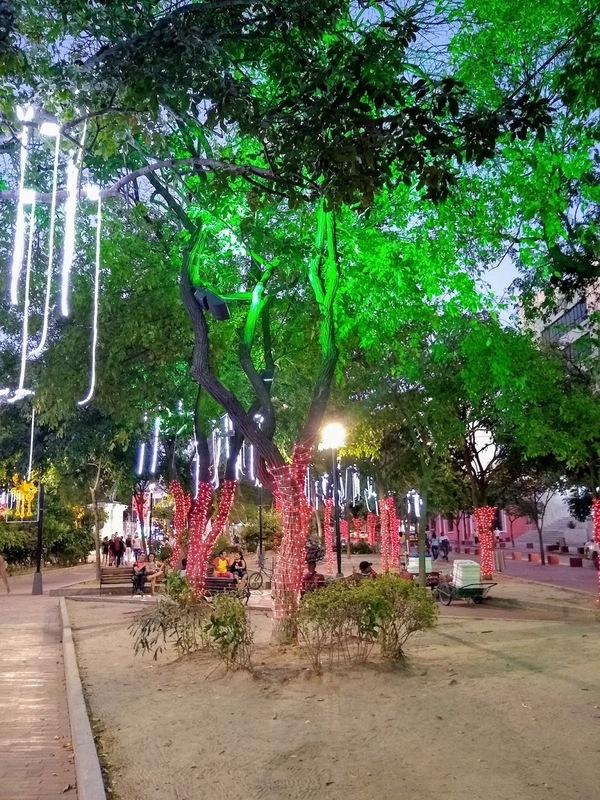 Throughout the city are Venezuelans refugees. They are often in pairs or in family groups, asking for help, asking for money or trying to sell small candies from a bag they are carrying. Sometimes they approach us as we are sitting at an outdoor restaurant. They will place some candy on the table and step back, as if they are giving us a present. If we were to eat it we would then owe them money. After about 30 seconds if we have not touched the candy they return and take it back. 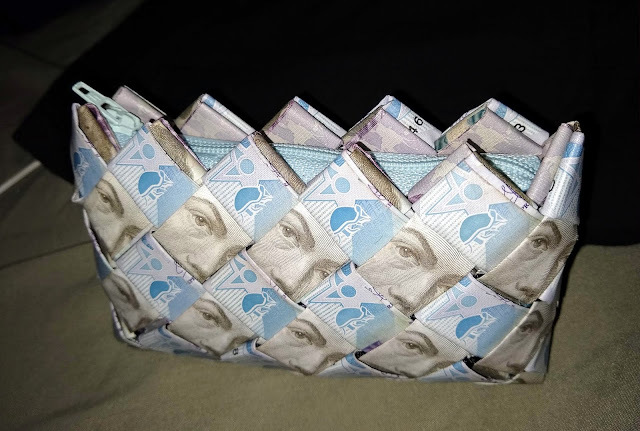 Several of the Venezuelans have begun making purses or bags out of their worthless paper money. By selling the money this way they can reap much greater value for the currency. The problems are 1) they are not supposed to be working in Colombia, and selling these is considered work, and 2) it is illegal to import the Venezuelan money. For these reasons it can be difficult to find the vendors of these bags. I had heard about them and was actively searching for them, but it wasn't until our last day in Colombia that I actually found a seller! The Venezuelans are in a tough position. Their country and its currency are in shambles. 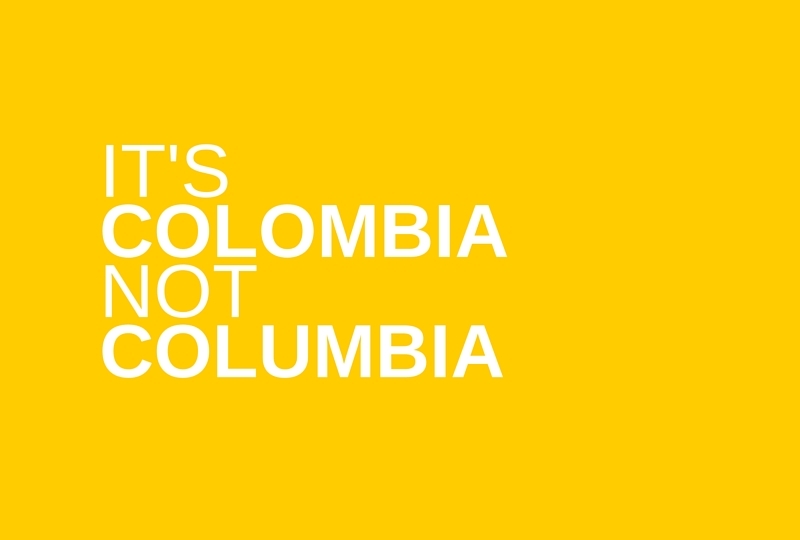 They can't go home, and they are not allowed to work in Colombia. They arrive here with nothing and have to try to survive. Occasionally some of them will show us some Venezuelan ID to emphasize that they are not Colombian beggars, or they will say "no soy malo", I'm not bad. It is a very sad situation for them. Years ago it was the Colombians fleeing to Venezuela to escape the violence in Colombia. Colombia's situation has vastly improved, and now the tide of refugees has shifted in the other direction. Politics certainly can play havoc on people's lives.